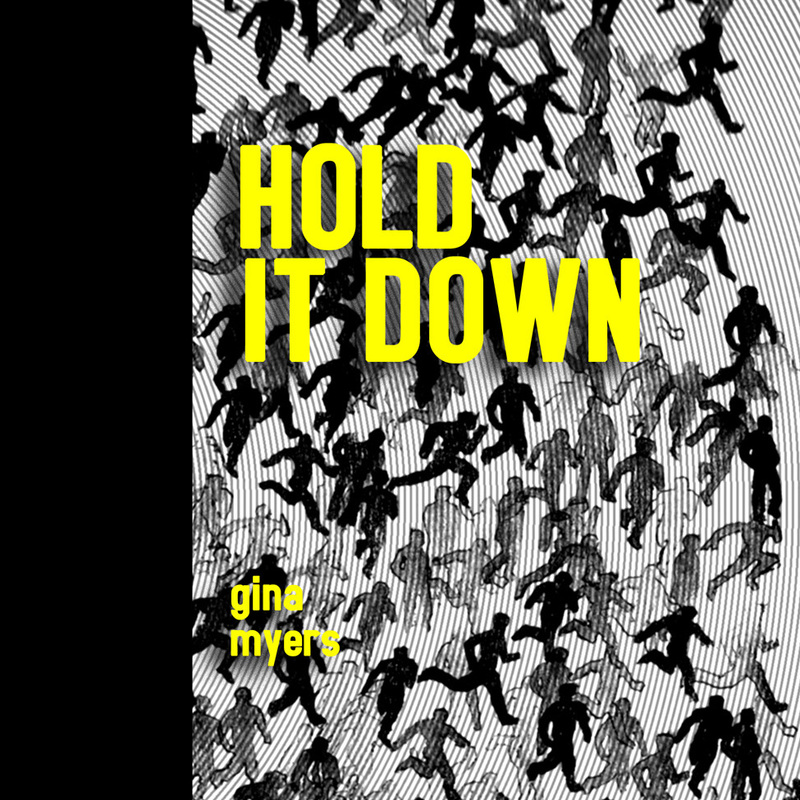 Gina Myers’ second full-length collection of poems, Hold It Down (Coconut Books, 2013), centers itself around the two long poems “False Spring” and “Behind the R,” both of which explore the terrain of the speaker’s consciousness as she lives, works, and writes in a particular city. In 1883, Emma Lazarus immortalized the Statue of Liberty in her sonnet “The New Colossus.” She envisioned the statue as a monument to “world-wide freedom” that welcomed the tired, poor, and huddled masses who yearned “to breathe free” in the United States and make a better life for themselves. The “dilapidated” images of Brooklyn with which Myers surrounds the statue suggest that the city, our country, and the ideals of liberty and freedom have begun “crumbling into the water,” both physically and psychically. We rust. We are overgrown with weeds. We are hounded by wild dogs. We are lost in our own streets. Yes, there is no shortage of fears that the city and its ruins can induced within the speaker. Moreover, these fears might be “the very language” needed “to articulate our unfreedom” (20), thus eradicating our false belief in the freedom we think we experience. The combination of unfreedom, fear, and a crumbling surroundings, though, begs the question: Where is the hope? If everything fails, what is to stop us from sliding into the very nihilism the speaker mentions in her list of fears? The answer the poem offers is to turn “a blind eye / to the newspaper stand” (45) and disengage from the narratives forwarded by mainstream media and the like. Gina Myers has a lot to think about. Some chief concerns: How did all of these pencils get in the grass? What is she trying to say? How did Louisville beat Michigan in the NCAA Championship last night? What constitutes a time travel love story? Does Bill and Ted Count? 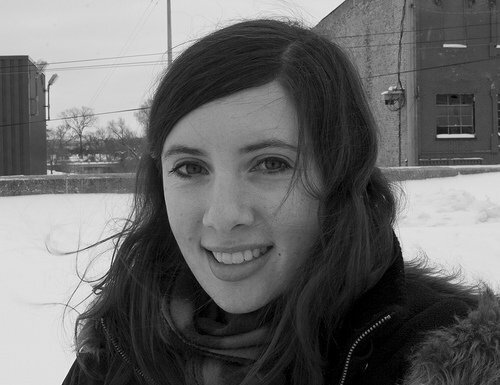 Gina is the author of False Spring and A Model Year. Her forthcoming collection, Hold It Down (Coconut Books) will be released next Wednesday at the next Vouched Presents at the Goatfarm. So what are your top five favorite time travel love stories? When you put it like that, Homer Simpson may be the ultimate romantic time-travel protagonist. He’s like a modern-day Odysseus of sorts! Do you view him as a tragic figure? I am sure here that you intentionally compared him to Odysseus because he plays Odysseus in the episode where they re-enact classic tales. While passing through the river Styx, skeletons on the shore are rocking out to Styx’s “Lady,” and Homer exclaims, “Oh, this truly is hell!” He does share certain qualities of other tragic heroes–for example, it is usually his own flaws that cause his problems, but he frequently is able to dodge truly tragic outcomes. Things usually work out for him, or at the very least return to the status quo. Life is really an uphill battle for Homer Simpson. Do you have a favorite episode of the Simpsons? I think mine may be the Lord of the Flies episode, though it’s hard to say for certain — there are so many episodes. Do you love the Simpsons so much that you wish you could travel back in time just to watch it with fresh eyes and fall in love all over again…? Ha! My dream time travel love story! Recently I rewatched seasons one and two for the first time since they originally aired. I was a little worried–my memories of those seasons seemed a little embarrassing, but they were much better than I remembered! It was a little like time travel I suppose. I don’t think I would want to be ten again, though, nor would I want to be my present age somehow back in 1990. But if I did travel back, then maybe I could have watched Twin Peaks as it originally aired! Man, despite Ronald Reagan and George H.W. Bush, 1989/1990 had some pretty awesome things going on. If I were able to time travel, I would remember to buy some bootleg Simpsons t-shirts from the Giant Public Market in Saginaw because I would love to wear those still today. You keep bringing up Twin Peaks, which leads me to think have a tendency to watch television shows which have a recurring theme of donuts. Is this the case? Is this an illuminati conspiracy? I do like TV shows that feature donuts! And I like to eat donuts. And I like J Dilla’s album Donuts. And I once did an art project in high school where I painted a series of donuts. I don’t think it is an illuminati conspiracy though, or if it is, I have yet to reap any benefits it. It seems like a lot of people like donuts, which makes me wonder just how large and far-reaching this illuminati is…. Vouched: We need to get to the bottom of this. Let’s start with the Krispy Kreme on Ponce – it may be Illuminati headquarters. My mind is reeling with questions so I’m just going to list them. • What percent of the attendees of the reading on April 17th will be members of the illuminati? • How many donuts could you consume throughout a day? • When you read, will be sneaking in Illuminati trigger words? Dropping hints to audience members ‘in the know’? • Would you travel through time for love? How would you go about it? Thirty-three percent of the audience will be members of the illuminati. If I challenged myself to see how many donuts I could eat in a single day, I’d say that number would be 33. Did you know 33 is an important number in the illuminati? All of my poems are exactly 33 words long. When the New World Order is in place, we won’t need to travel through time for love. The New World Order is Love. So excited to announce that the What’s New in Poetry Reading Series, hosted by Emory’s Poetry Council, will be hosting poet Amy Gerstler this Friday, July 20th at 8pm in the Schwartz Center Black Box Theatre. RSVP on Facebook here! Gerstler is the author of seven books: Dearest Creature (Penguin, 2009); Ghost Girl (2004); Medicine (2000), finalist for the Phi Beta Kappa Poetry Award; Crown of Weeds (1997); Nerve Storm (1995); Bitter Angel (1990), winner of the National Book Critics Circle Award; and The True Bride (1986). Additionally, she is the author of art reviews, books reviews, fiction, and various journal articles. 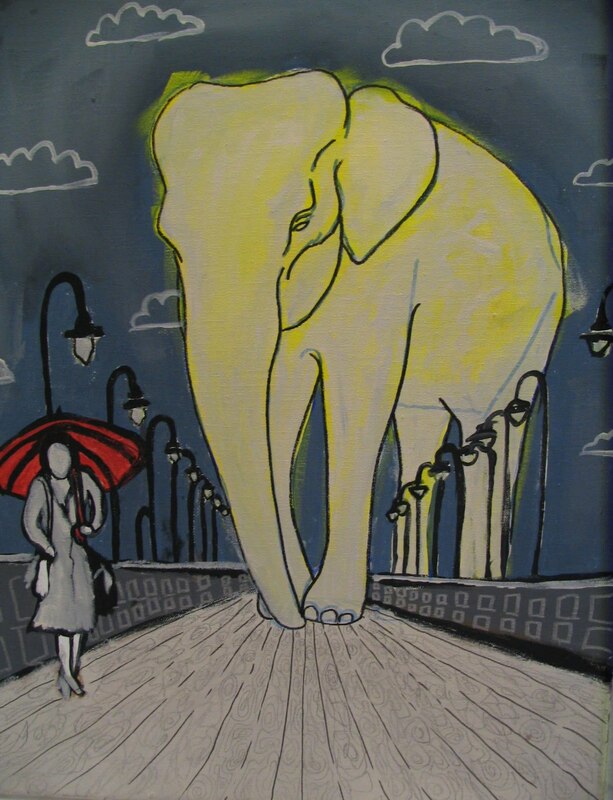 She also collaborates with visual artists, and her writing has been published in numerous exhibition catalogs. Gerstler received her BA in psychology from Pitzer College in 1978 and her MFA in nonfiction from Bennington College in 2000. A resident of Los Angeles, Gerstler has taught at Antioch West and the University of California at Irvine’s graduate writing program. She teaches in the Bennington Writing Seminars program at Bennington College in Vermont, and at Art Center College of Design in Pasadena, California. I would let Gina Myers narrate my life. Her voice is as calming as Sigourney Weaver’s. You can hear for yourself on November 9th at our next Vouched Presents. She has lived in Saginaw, Michigan, New York City and now lives in Atlanta. All of these cities have taken up residence in her poetry. They live and breathe in her sentences, the way we live and breathe in their streets. Her collection, A Model Year, was released by Coconut books in 2009. Vouched: Okay, let’s start with the important stuff. You’re a really big sports fan. How has that influenced your writing? 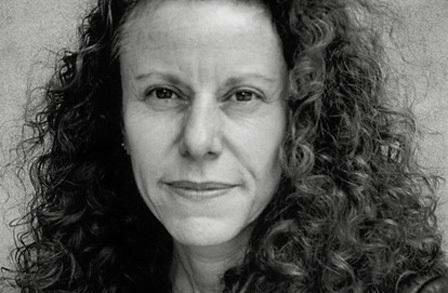 Gina: I think sports, like literature, is a form of escape for many people. Some of my earliest memories involve listening to the Detroit Tigers on the radio, trading baseball cards with my brother, and hearing my grandpa complain about Sparky Anderson. It provides an outlet or distraction from the everyday, especially when the everyday isn’t so pleasant. We constantly hear negative news reports of Michigan’s economy and crime rates, but the Tigers can give us hope. Or the Lions. Even if for years they’ve brought us misery, it’s a bonding experience that connects fans with each other. And sports has a lot of parallels to literature–the fallen heroes, the lovable losers, the possibility of redemption. Vouched: That leads me to two questions: 1. Do you still have your baseball card collection? 2. Do you have a favorite ‘lovable loser’ from your teams? Gina: I no longer have my baseball card collection. I’m not sure when I got rid of it but probably sometime during high school after it sat neglected in a shoebox on a shelf in my closet for years. As a kid, I loved Doug Baker, who was a complete nobody, but my brother–who is older than me–told me that he was a really great player, and he was really doing me a huge favor by trading the Doug Baker card for whatever card of mine that he coveted. More recently I was a big of Joel Zumaya, a pitcher for the Tigers, who was an amazing talent but could never get it together due to injuries. Vouched: If you had to choose between having a peg leg or a pirate hook, which would you choose and why? Gina: I’d go for the hook. I love walking & I’d be concerned that the peg leg would slow me down. And if I had the hook, I wouldn’t have to worry so much about safety walking through the city at night. Vouched: A hook would certainly be very vicious. Are you dressing up for Halloween? Gina: Right now I don’t have any plans for the night, so I haven’t thought about a costume. But if something comes up, I’ll put something together. I love Halloween but frequently miss it or under-do it each year. The day after I always think, next year I should plan better, but I never do. Vouched: What’s your favorite thing about Halloween? Scary movies? Crazy people? Haunted Houses? Gina: All of the above! When I was young, I always liked the Halloween episodes of TV shows like Roseanne and The Simpsons, and scary movies were a sleepover staple. I haven’t been to a haunted house since I was in high school, but I used to enjoy doing that too. I kind of like creepy things–cobwebs, cemeteries, spiders, and so on. And I like mischief too, and Halloween allows for some of that. In Michigan, we have Devil’s Night, which is on October 30th, and is a night of mischief–smashing pumpkins, egging houses, toilet papering, etc. But in more recent years it’s become more known as a night of arson, and some community organizers and church-minded people have attempted to rebrand it Angel’s Night. Vouched: I’m a big fan of the Simpson’s Halloween episodes too! 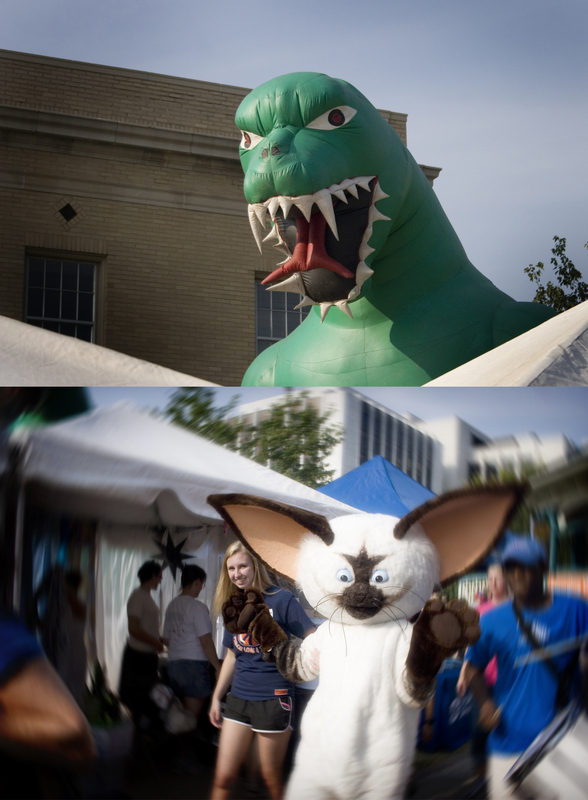 Have you considered bringing Devil’s Night to Atlanta? It sounds like April Fools Day covered in darkness. April Fool’s day is a personal favorite of mine. I love me some pranks. Vouched: That’s stupendous! I bet his costume just kind of decides itself. I had a friend in high school named Michael Bolton, but he lived up to the name in the ‘Office Space’ sense a little bit more than the ‘Long-haired man whose voice makes 90’s moms swoon” sense. Speaking of, who do you think would win in a fist fight: Yanni or Michael Bolton? Gina: Michael Bolton. Gut instinct. 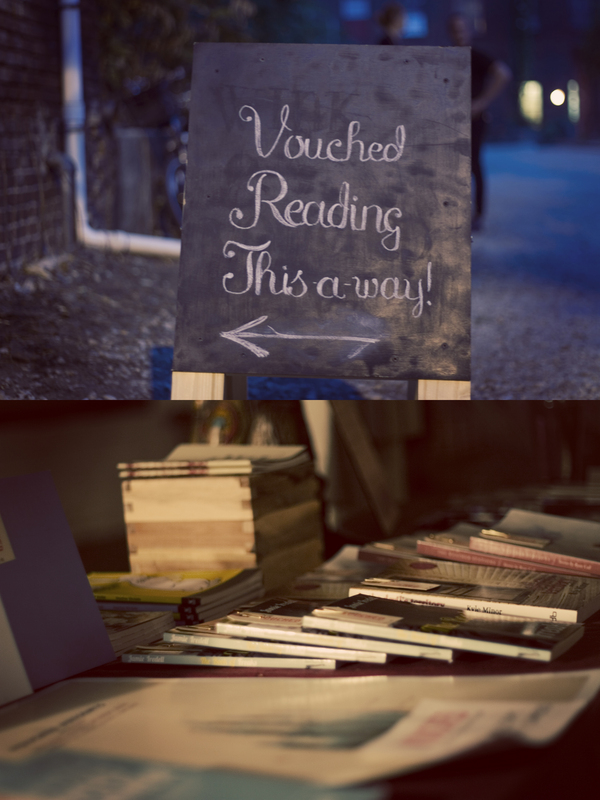 Vouched: How would you go about persuading someone into attending our reading on November 9th? Gina: It will be a great escape from the everyday. Plus there will be goats! Whoa September flew by! It feels like maybe October is following suit. Before time gets away from me I’d like to do a round up of VouchedATL’s September happenings. But since it’s October, I’ll sneak a trick in the treat: this whole post is backwards. We had a reading on September 19th! It was full of wonder and glory! Our readers were stupendous! The venue was amazing! The audience was beautiful! Here’s a picture of Molly Brodak and Matt DeBenedictus reading to us. They charmed everyone’s pants off. Molly made caramels and they were absolutely delicious. That tells you a lot about Molly, doesn’t it? I can only imagine that it takes great patience and precision to make chocolate dipped caramels. She’s just as careful with her words, and it shows. Matt gave everyone choices. He would hold up his hands and summarize option 1 and option 2. It was kind of a Choose Your Own Adventure situation. Who doesn’t love choosing their own adventure? At the end of one of his stories, about different popes, he stood up on his chair like a boss. It was great. Before them Cristina Martin read. Her poems are sweet and carbonated like champagne, brimming with description that bursts off the page. They’re beautiful to hear. Cristina read after Daniel Beauregard, whose poetry is full of undercurrents and introspection. This is what they looked like reading. First of the evening was Sarah Beard, who was spritely and potent. Before her there was set-up times. Check out the amazing lighting that the goat-farm had for us! 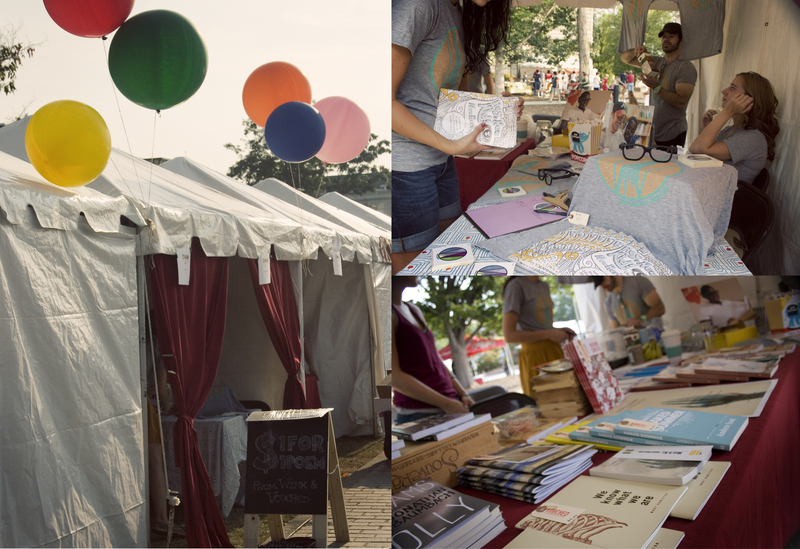 The VouchedATL Chalkboard actually made its debut a week before at the Decatur Book Festival! Two days of book-loving bliss with the great people of Wink! The pictures say quite a bit for me. Also a thousand thank you’s to the good people of the Goat Farm who were so incredibly helpful . More thank you’s to our stupendous readers! Thank you to Wink for being the best bunch of booth buddies! Thank you to my awesome husband for being such a champion with a camera! Our next Vouched Presents reading will be Wednesday, November 9th at the Goatfarm, with awesome readings by Robert Pfeiffer, Gina Myers, Tom Cheshire, and Amy Herschleb! More details, Awful Interviews, and an awesome poster to come!